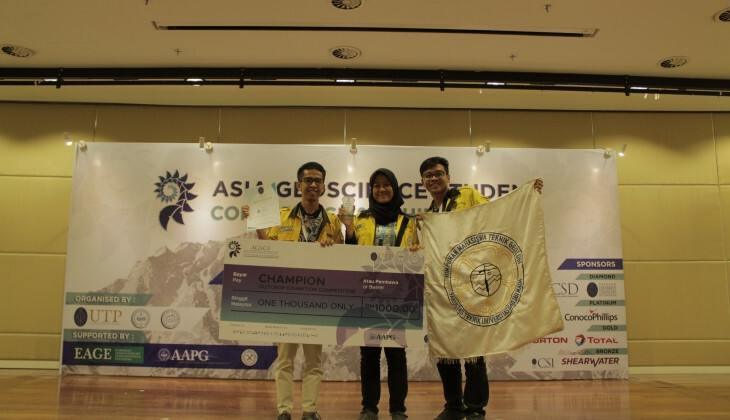 Six engineering students of Universitas Gadjah Mada has earned awards in the Asia Geoscience Student Conference Exhibition (AGSCE) 2018 held at Universitas Teknologi Petronas. They are Benno Zola Triadi, Handika Lazuardi, Alse Nabilah, Nur Indah, M Joko Tri P., and Klemens. They won the Grand Champion title in the Outcrop Competitions that was joined by 20 best teams in Asian region. Team chairman, Benno Zola Triadi, said in this competition each participant had to make a real model of Outcrop and analysed unique outcrop data hailing from their respective regions. “The Universitas Gadjah Mada team raised the petroleum system that is implemented in the outcrop in Sendangharjo village, Blora regency, Central Java Province,” said Benno at UGM on Monday (5/11). Benno said the competition ran for two days from 29 -30 October 2018. The participating countries included Indonesia, Malaysia, Thailand, Vietnam, Japan, and Australia. The Outcrop competition was run by presenting outcrop and data in the booth provided by the committee. “By replying to questions from visitors to the booth who are professionals and students became the criteria to get the grand champion title in the outcrop competition,” he said. Later, the participants made a presentation in front of the juries who assessed the data quality. The UGM team was represented by Benno Zola Triadi and Handika Lazuardi that were able to give a positive response from the juries. Benno Zola Triadi said attending the international competition was fun. Admitting the busy preparation they had made before the competition, he felt he earned many benefits of building an image and getting to know more people from other countries.